Hibernian missed the chance to go level on points with Queen of the South as the two Scottish Championship sides drew a blank at Easter Road. The hosts had the better of the play throughout, with Jason Cummings and Scott Allan going close early on. Paul Hanlon had the best opportunity of the first period, his header cleared off the line by Queens' Matt Kerr. Cummings shot wide from distance after the break and Paul Heffernan could not make the most of a decent opportunity. Match ends, Hibernian 0, Queen of the South 0. 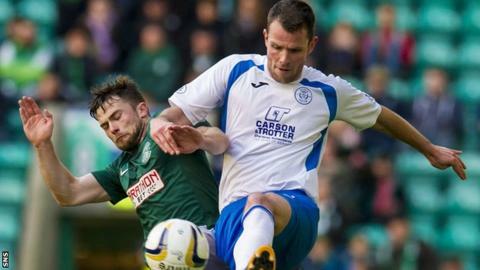 Second Half ends, Hibernian 0, Queen of the South 0. Attempt missed. Mark Durnan (Queen of the South) right footed shot from more than 35 yards is close, but misses to the left. Attempt missed. Ian McShane (Queen of the South) right footed shot from outside the box is close, but misses to the right. Matthew Kennedy (Hibernian) wins a free kick in the defensive half. Substitution, Queen of the South. Kevin Dzierzawski replaces John Baird. Attempt missed. Paul Heffernan (Hibernian) right footed shot from the centre of the box is just a bit too high. Corner, Hibernian. Conceded by Chris Higgins. Attempt saved. Paul Heffernan (Hibernian) right footed shot from the right side of the box is saved in the bottom left corner. Substitution, Queen of the South. Lewis Kidd replaces Iain Russell. Attempt missed. Samuel Stanton (Hibernian) left footed shot from outside the box misses to the right. Scott Allan (Hibernian) wins a free kick on the left wing. Foul by Iain Russell (Queen of the South). Iain Russell (Queen of the South) is shown the yellow card. Foul by Paul Heffernan (Hibernian). Substitution, Hibernian. Samuel Stanton replaces Jason Cummings. Jason Cummings (Hibernian) wins a free kick on the left wing. David Gray (Hibernian) is shown the yellow card. Corner, Queen of the South. Conceded by Liam Craig. Liam Craig (Hibernian) is shown the yellow card. Substitution, Queen of the South. Gavin Reilly replaces Derek Lyle. Substitution, Hibernian. Jake Sinclair replaces Alex Harris. Substitution, Hibernian. Paul Heffernan replaces Daniel Handling. John Baird (Queen of the South) wins a free kick in the attacking half. Foul by Alex Harris (Hibernian). Kevin Holt (Queen of the South) wins a free kick on the right wing. Attempt missed. Jason Cummings (Hibernian) left footed shot from outside the box misses to the left.